Well, I have been testing and re-testing a lot of gear that I want to use to run in the NorCal Tough Mudder. I’ve been quite happy with my Under Armour ColdGear top and leggings (compression fit). I’ve tested it running in cold weather and even jumped into a cold river to see how warm it would keep me after I had been fully submerged. It works! I didn’t feel very cold and I warmed up quickly as I started running again. Do I look a bit silly wearing leggings? Yep. Do I care? Nope. I have seen guys wearing much crazier stuff at the Tough Mudder (think loincloths and thongs), so I don’t think my appearance is going to matter much and I want to be warm in that icy water. I’m also a huge fan of the Vibram FiveFingers barefoot shoes. I wear a pair every day and I do a good amount of trail running in pair of Trek Sports. But, I found that for aggressive uphill sprinting my smaller toes kept slipping out of the toe “pockets”. So, I bought a pair of Merrell Trail Glove minimalist shoes and I am pretty happy with them (see my earlier review). They’re light, drain water well, and have good traction in mud. I did find that smaller rocks tend to get into them, however. So, I bought a pair of Nike Elite running socks that are super thin. I barely notice them, but they make things a bit more comfortable when rocks and dirt creep into the shoes. I’ve read that your hands can take quite a beating in the Tough Mudder. You do a lot of climbing over obstacles, sliding down hills, and crawling across rocky ground. You also spend a lot of time in cold, muddy water and your hands end up getting really wet and cold. So I bought a pair of ColdGear receiver gloves from Under Armour. They will protect my hands a bit and hopefully keep them a bit warmer so that I can keep some strength and flexibility in my hands for obstacles like the Funky Monkey. I have debated whether I should wear sunglasses or some sort of eye protection. I have read some pros, but mostly cons. There are simply too many water obstacles, mud, and leaps into water to wear sunglasses. I’m sure they would get covered in mud and ripped off my face anyway. So I’m not going to wear them. I have also debated wearing some sort of headgear. I’ve read about folks wearing some headgear and even things like a balaclava. I’ve decided it is more of a hassle than it is worth, so no headgear. So there you have it. That’s the gear that I have tested and will be wearing for the upcoming NorCal Tough Mudder. 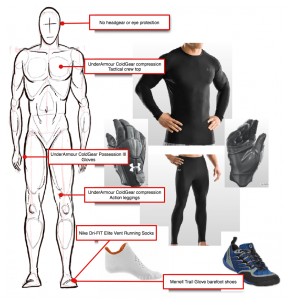 I’ve tried to balance cold weather protection, breathability, water handling, weight and comfort to put together an optimal set of gear. Let me know what you think in the comments! Great ideas here. Any follow-up on how they worked? Anything you’d do different next time? * The trails were much rockier and we ran a lot more than expected. My feet got pretty sore in the minimalist shoes and the last 2 miles of running were agonizing. I want a slightly thicker sole next time. * The gloves protected my hands well, but they were still slippery when they got wet. So, I took them off for the Funky Monkey to just use my bare hands for a better grip. * The compression leggings and top worked very well for warmth and flexible movement. It also protected my knees and elbows a bit when crawling on rocks. They certainly kept me warmer in the icy cold water, but the top did retain the moisture. Out of the water, I’m not sure if I would have felt warmer without a shirt or not. Hard to tell, since it was way too hard to pull off a wet compression top! I just left it on. Thanks for the recommendations! My Tough Mudder is in August, so I’m wondering if I’d get too hot in Under Armour cold gear. I do have some, and did read it’s recommended … hmm any advice? When was your Tough Mudder? Have you considered using some type of gators for your shoes. I have some 5 finger shoes. I like them a lot but find that dirt/sand slides right into them. I kinda wish there was a good solution for this.